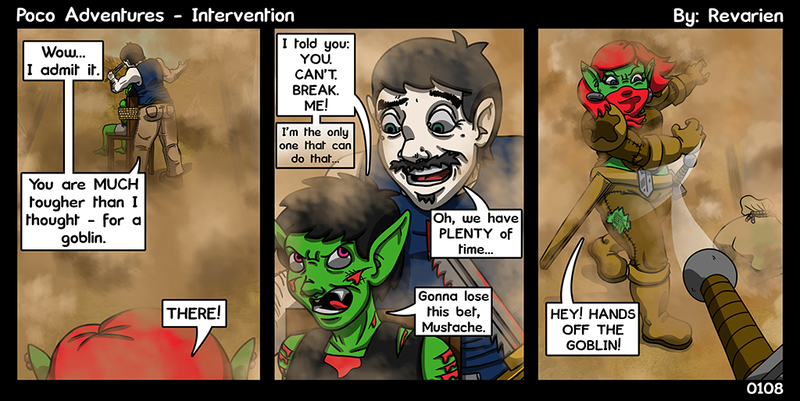 Felix is hinting at a touch of depression, btw… but by the gods he is such a tough gobbo. This comic and the next one are slightly ‘time-shrunk’ e.g. the timing overlaps a tad… don’t worry, we stay with this action, but you’ll see what I mean when we get there. I took off this last Thursday and Friday to work on comics and be a dad and whatnot, and ended up sick… that’s right – my scheduled time off was yet again another scheduled sickness. I think that’s 3 in a row now >.< c'est la vie Please remember to vote on Topwebcomics! Favorite on The Webcomic List! Stupidly announcing yourself to your target? – Also yes. I’m glad he’s still alive, concerned that the premature announcement will get him killed.